Prof. M. P. Varghese, an eminent scholar and great organizer, was born in an aristocratic Christian family - Manjummekudiyil - in Central Kerala (India) at Keerampara in Kothamangalam Taluk, on 29 June 1922. 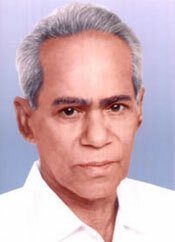 He graduated in Economics from Union Christian College, Aluva with a Gold medal from the Travancore University in 1945. He took his Master’s Degree from Madras Christian College in 1947 and M. Litt. from Madras University in 1951. During 1957-58 he spent one year in Oxford doing research work on 'Keynes General Theory' under the renowned Economist Sir Roy Harrod. His public life started in 1952 when he became a Member of the Legislative Assembly of the State. From the very beginning his main interest was the establishment of educational institutions in the field of higher education. In 1953 he became the Founder Secretary of the Mar Athanasius College Association, which established the Mar Athanasius College in 1955, Mar Athanasius College of Engineering in 1961 and Athanasius College High School in 1966, Mar Baselios College at Adimali in the Idukki District in 2003 and the Mar Athanasius International School in 2008. He is the main source of strength behind all these institutions and he continued to lead them as the Secretary of the Association and Manager of the Institutions. Prof. Varghese joined as a faculty of Economics at Mar Athanasius College in 1955, a college which was established largely by the untiring efforts of Prof. Varghese and his associates. He held the dual posts of Principal and Professor in Economics from 1963 to 1982 with a break of three years between 1969 and 1972. Prof. Varghese brought his research work, started in Oxford, to a fruitful culmination by publishing his two books in Economics, namely; A Criticism of Keynes’ General Theory and Theory of Economic Potential and Growth. He continued to associate with the college as a Professor and later as the Secretary (Chief Executive Officer) of Mar Athanasius College Association till his demise. In addition to providing effective leadership to Mar Athanasius College Association as its Founder Secretary, Prof.M.P.Varghese held the following additional responsibilities too: Chairman of the Organization for Protection from Nuclear Radiation, Chairman of Organisation of Farmers for Establishment of Rights and Chairman of Organisation for Protection of Technical Education in Kerala. Prof. M.P. Varghese was honoured with the ‘Acharya Award’ for his eminence as a scholar and an untiring organizer, ‘ Akshaya Award’ for his outstanding services in the field of Higher Education, ‘Sevana Retna’ by Y’s men International, ‘Desa Retna’ by Kothamangalam Municipality, ‘Suvarna Rekha’ by Suvarna Rekha registered cultural society and ‘Vikas Award’ for his yeoman services rendered in various realms of life, and ‘Prakruthi Mithra’ puraskaram in recognition of his outstanding services for the protection of environment.